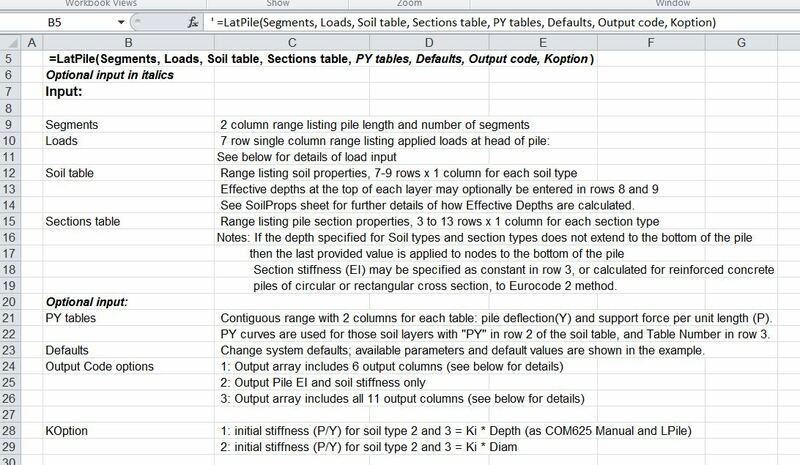 Following some discussion at Eng-Tips and elsewhere I have updated the LatPilePY spreadsheet, previously presented at Lateral pile analysis with PY curves … This spreadsheet provides User Defined Functions (UDFs) to carry out the analysis of vertical piles under lateral loading, following the method described in the manual for the program COM624. See the earlier posts for more details. The new spreadsheet, including full open source code, can be downloaded from LatPilePY.zip . Where the ultimate soil resistance is controlled by wedge failure the failure load is affected by all the layers through which the wedge passes. Where the initial stiffness of a soil is related to the vertical pressure, this is affected by the density of the overlying soils. For deeper layers, where the ultimate resistance is controlled by soil flow around the pile, the failure stress of granular soils is related to the vertical pressure. The depth of soil, with the same properties as the layer, that would have the same ultimate resistance to wedge failure as the actual upper layers. The depth of soil, with the same density as the layer, that would have the same vertical pressure as the actual upper layers. 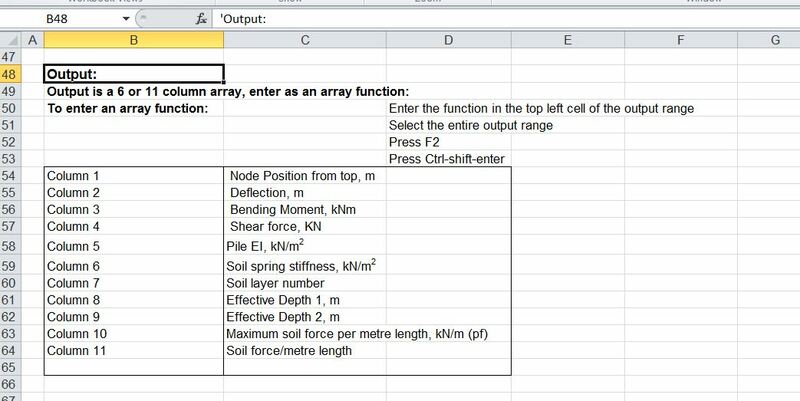 The other major change is that additional columns may (optionally) be added to the output array, providing details of the calculated effective depths, ultimate soil resistance, and calculated soil force/unit length of pile. Where the effective depth has been calculated by the spreadsheet the agreement was less good, but maximum bending moments and shear forces are within about 10%. The reason for the difference seems to be that the spreadsheet calculates an effective depth based on density, whereas COM 624 uses the actual depth in these cases. 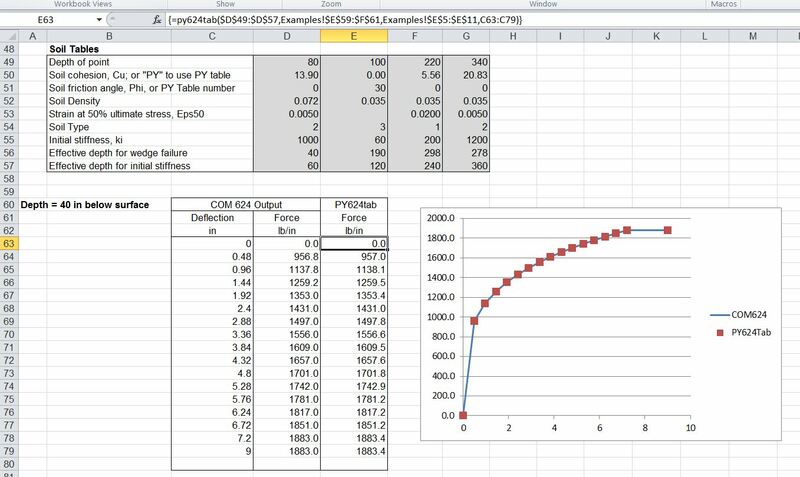 This entry was posted in Concrete, Excel, Geotechnical Engineering, Newton, UDFs, VBA and tagged COM624, Excel, laterally loaded piles, PY curves, soil properties, UDF, VBA. Bookmark the permalink.